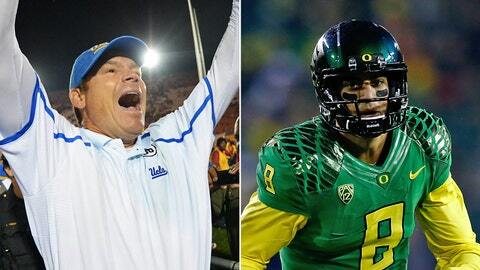 UCLA coach Jim Mora and Oregon QB Marcus Mariota are sticking around for next season. USC athletic director Pat Haden took the podium Tuesday to officially announce the hiring of the Trojans’ new head football coach, Steve Sarkisian. But as if beating down the Trojans 35-14 on their home field at the Coliseum on Saturday didn’t steal enough of the local spotlight, crosstown rival UCLA announced their head coach will be staying in Westwood through the 2019 season even before the microphone at the USC press conference had been unplugged. "Jim Mora has established himself as one of the preeminent coaches in all of college football," UCLA athletic director Dan Guerrero said in a press release posted on the school’s athletics website. "Under his guidance, UCLA football has garnered national recognition for its success on the field, in the classroom and in the community. We are excited about the commitment Jim has made to our student-athletes and this University and feel this extension further demonstrates UCLA’s commitment to building a championship-caliber football program." Prior to the announcement, there was speculation that Mora would fill the vacancy left at his alma mater by Sarkisian. In fact, the six-year contract extension was agreed upon by Mora and the Bruins after Washington offered Mora the Huskies’ head coaching job Monday, reported Scout.com. Mora has led the Bruins to 18 wins and three losses over two campaigns as head coach. Amid all the commotion in SoCal, Oregon also decided Tuesday afternoon was the perfect moment to announce that redshirt sophomore quarterback Marcus Mariota would be returning for the 2014-15 campaign, according to an article on Goducks.com. "It is an honor to be a student at the University of Oregon and to have the opportunity to represent our institution on the football field alongside my teammates," said Mariota, who has thrown 30 touchdowns and only four interceptions this season. "I look forward to earning my degree next year and to the rest of my career at this great University." Center Hroniss Grasu, one of the teammates Mariota is most familiar with on the field, will also return for the Ducks next season. Both players were named to the Pac-12 offensive first team. The series of announcements by three conference heavies arrived as seventh-ranked Stanford and No. 11 Arizona State continue to prepare for Saturday’s Pac-12 Championship. The Trojans’ Sarkisian spent the previous five football seasons at Washington, where he accumulated a record of 34-29. "I am humbled and honored to be the head football coach at the University of Southern California," Sarkisian said Tuesday. "Growing up in this area, this place means so much to me that to be able to stand before you, to say that for the first time, it’s extremely humbling." On Tuesday, both coaches reiterated the same goal. "We’re here to win championships," Sarkisian said repeatedly. "This staff came here with a commitment to win a national championship; that commitment stands," Mora countered. But in a conference that only appears to be getting stronger and deeper, all Pac-12 programs know there won’t be enough titles to go around next season.